Although my loctician had advised me not to wash my locs for 2 months (?!?!!) I couldn't take it anymore and went against her orders and washed it a few days before this picture was taken. Cleaning my scalp with astringent just wasn't cutting it, and if anything was making my scalp go berserk (I have dermatitis issues that get worse in the winter). I also work out at marital arts class 2 to 3 times a week. I needed water and soap. So here's what I did: I rubber banded the ends of my hair in about 5 sections in attempts to minimize untwisting. I didn't use the shower head to wet my hair; rather, I used a water bottle and poured the water gently over my head. This was to cause the least amount of disturbance to the coils. I used T-Gel shampoo (remember, no "creamy" shampoos cuz they contain conditioner.... a no-no for new locs) which I applied using my fingertips and gently rubbed my scalp. Again I rinsed using the water bottle. I wrapped a towel around my head for several minutes and squeezed, not rubbed, to dry off the excess water. The goal in this whole process is to hold the coils intact as much as possible. I retwisted my hair using double prong clips, diluted setting lotion and a very small amount of Organic Root Stimulator Loc 'n Twist Gel. I didn't really use a palm rolling technique since the twists are still mostly hollow coils, but instead I very gently twisted them with my fingertips to smooth down the loose hairs, using just enough ORS gel to barely coat my fingertip. I finished off with some oil and let it dry. Everything turned out beautifully, although it was a little flat at first, but a few days and an evening of sweating in tae kwon do class took care of that. I've since switched from using astringent in between washing to using witch hazel, which also has astringent properties but contains a lot less alcohol to dry and irritate your scalp. 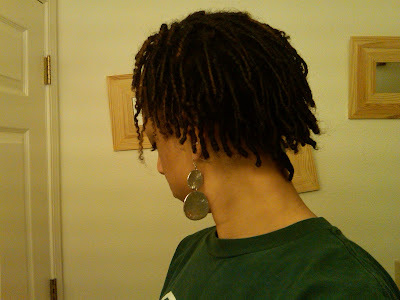 I do this about once a week and very gently retwist (over twisting can cause breakage). I just can't go weeks without doing anything to them, one because of my scalp issues, and two because I believe that just because you have locs it does not mean you cannot groom your hair. So far I am absolutely loving my hair and am not regretting starting over for one minute. I think the curly-qs at the ends are rather adorable, and I'm starting to see the beginning of budding about 1/2 inch from the roots which I'm very excited about because it means I can shampoo more often. I'm still taking things slowly because, like many things in life, when you get to eager and rush you make mistakes. But so far, so good. Stay tuned for more updates, my pretties! I could've cried at this post. I'm having a loc crisis of my own. After 9 months of 'trying' to get locs diy style, I've booked myself in to see a professional. My plan is to get them retwisted by someone who can actually see the back of my head and not wash them for a month, maybe longer, then continue by myself. At first this seemed extreme but I'm hanging onto this journey by a hair and really need to see some progress. I was washing my hair very frequently but I think I've prolonged the loc'ing process by washing TOO often never giving my hair time to matt. I too used witch hazel in the beginning and look forward to trying it again now that I have a plan. After the first month, I think I was washing every week and a half or so....as long as I could go without my scalp itching to the point where it hurt. I think I was still using the rubber banding technique, too.